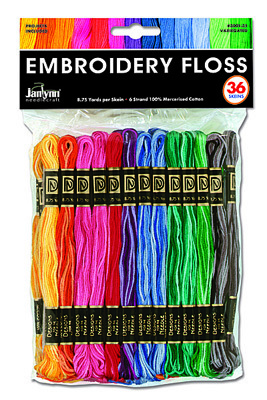 Easy to stitch or craft with these 100% Cotton Embroidery Floss Skeins especially at VALUE PACK prices! Each package contains 36 skeins of 8.75 yards (8 m) 6-strand 100% Cotton Floss in a variety of 10 Variegated colors, yellows, oranges, reds, lavenders, blues, greys, pinks, turquoises, watermelons, and greens. Product of DFN™, A Janlynn Company.